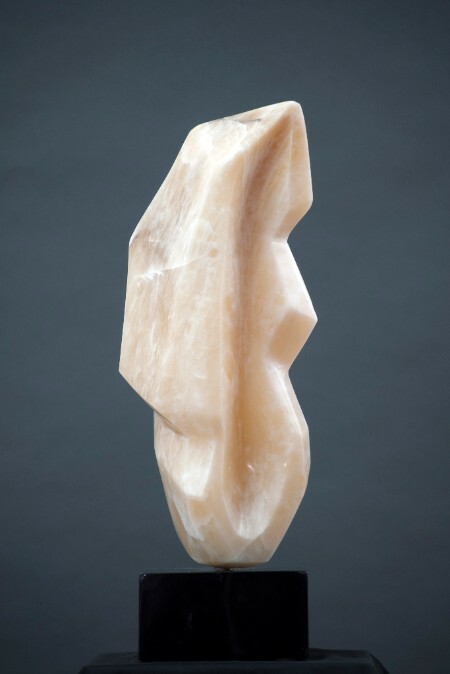 This month’s sculpture started out as a rectangular block of rich, translucent, honey colored alabaster. The stone was cut into a straight block when I purchased it as the raw material. What a perfect time, I thought, to experiment with a more angular, cubist design rather than my usual curvilinear style. Normally, I begin using a naturally occurring irregular piece of stone and I allow the shape of the piece to influence my design. Since there were no natural guides to follow in this very oblong, almost brick shape piece of stone, it was a challenge getting my creative juices cranking. After giving considerable thought, I recalled the rich angularity of South Beach, Miami architecture. Yes, I thought, let me transform this “block” into an original art deco design. I had found, indeed, my inspiration and I began to “chip away”. What I present to you is my interpretation of a time reminiscent of the glory found in the era of Art Deco design! I call it “Deco”.